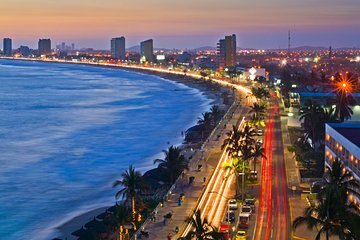 Visita turística de la ciudad, la playa, tiendas y deliciosas gambas; todo en esta excursión de 5 horas por lo más destacado de Mazatlán. Disfrute de las increíbles vistas del mirador desde el antiguo fuerte español, y visite el centro histórico de la ciudad. Observe a los lugareños que se lanzan desde un acantilado, vaya de compras a lo largo del pintoresco malecón (paseo) y descanse en la playa como desee. Relájese con sus compras realizadas, acomódese en un suntuoso almuerzo mexicano con gambas, antes de que le lleven de vuelta a su hotel. Recorrido turístico de 5 horas por Mazatlán. Descubre estupendas compras en el paseo marítimo. Transporte de ida y vuelta en van con aire acondicionado desde los hoteles de Mazatlán y la terminal de cruceros incluida. Victor, our tour guide was the best. He took us wherever we wanted to go and he knew where to go for what we wanted. He was friendly and very knowledgeable about Mazatlan. We were picked up at the cruise port and had no problem even though we forgot our vouchers on the ship. They had our names and were waiting for us.Our tour guide Smilie was very informative. We were a party of four and all agreed this was the best tour of our cruise. Love the tour. Smiley knew a lot about the history and provided a lot of wonderful information. We saw the city through the eyes of some who lives and cares about Mazatlán. The cathedral was one of the highlights. The open market with its fresh fruits, vegetables and meats was very interesting. There was also local vanilla, sweets and pastries. Viewing the city from up on the hills was breathtaking. The little restaurant on the beach, El Capitano, had wonderful shrimp. The tour would not have been as enjoyable if not for Smiley. Best tour guide ever. So very friendly and patient as he explains the history of the city and the different sites we saw. Martin our guide was very good, he knew his history very well and was very amiable. We stayed at the Riu Emerald Bay and were the first to be picked up and got to hear about the geography and history of the area on our way to pick up the rest of the tour that arrived by cruise ship at the port in Mazatlan. Martin was very good about letting us know how much to tip the cliff divers which was less than what was being asked for. Enjoyed the time at the Cathedral and the market. There was a fabric store right behind the cathedral and if your are a quilter a nice place to be. Lunch was very good. It was right off the beach in the Golden Zone and there was time for us to browse around the area after lunch. The one thing that we were disappointed in was that we didn't get to go up to the lighthouse and get a view from up there. I realize that it would have been a bit of a hike and that not all in our party would have been able to do it comfortably but we would have like doing it. Great tour, Juan was great! We went on Sunday, but still had a fun(some places closed). We felt slightly scammed by the cliff divers.Talk price before you say yes to see him jump! Sights were beautiful! lunch was excellent with great view! (el capitan) Shopping was fun, again talk price first. Enjoy! I enjoyed what I saw, would have liked to get more of a chance to understand the European influence in the Centro Historico and I think the Icebox Hill area might have been more interesting than the extensive touring of the more recent El Cid subdivision. Great day out. Jean Carlos happy to accommodate what we wanted to do. He was very informative and it was very evident that he loved Mazatlan. Small group of 6. Would highly recommend. Great lunch too! Definitely would NOT recommend! There was 6 of us in our group and then 3 ladies were added once we were heading to the van. This tour is not worth the 45/person we paid. What we saw was a bunch of alley's and houses. Our guide, Jose, continued to talk about how important it was to him that he get a good tip. He said he only received 20 of what we actually paid for the tour so the tip was very important. He said he would take us anywhere we wanted to go. We told him he was the tour guide and we didn't know where he should take us. He took us to a small open air souvenir stop and then to see the cliff divers. We then went to the restaurant. When we got there, he tells us that he was only given 10/person for us to eat. We had talked to the 3 ladies that were with us and they paid 25/person without lunch. We told our tour guide there was nothing about that in the description. In addition, if we paid 45 and they paid 25 then we should have 20 each to spend. He left and came back and said we would get soup, shrimp dinner and drinks. If it weren't for those 3 ladies being put in our van, we would not have known we were being taken advantage of. We also found out at the end that the 3 ladies picked the tour when they got off the ship and didn't pay until the tour was done. Of course we had booked and paid in advance. I didn't really consider this much of a tour. Riding through neighborhoods and looking at houses that were owned by americans and cars that had US license plates was not really showing us Mazatlan. Whenever we saw a group walking, our guide talked about how lucky we were to be in a van and not have to walk, he showed us his dream houses several times. We rode down back alleys and didn't really learn anything about Mazatlan.